I mentioned in my last post how great the iPad is for carrying around many documents. The iPad doesn't access it storage memory the way a computer does: there's no file manager or explorer program. GoodReader (get it from iTunes here) is my file viewer of choice. Can you see the Word document in the file list? GoodReader can view Word, txt, html, pictures, video and PDF. GoodReader allows me to connect to a variety of cloud storage services, including multiple DropBox accounts. It's very fast — faster than using the DropBox app. I can annotate files on the iPad, and save to the original file or create a copy. 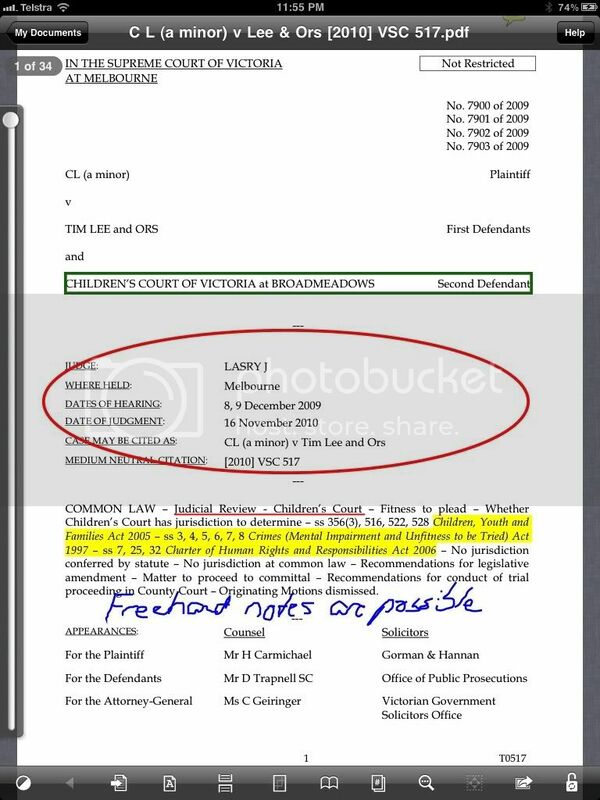 Recent versions of GoodReader view annotations created using Adobe Acrobat. GoodReader can transfer files over a WiFi network, or USB cable. It also has a really nifty trick when viewing documents on the internet. For example, if I search for an Act of Parliament, and open the PDF document in the iPad's web browser, Safari, what if I decide I want to keep that document? Simple, edit the URL in the address bar to insert a g at the start, and that document will download into GoodReader! 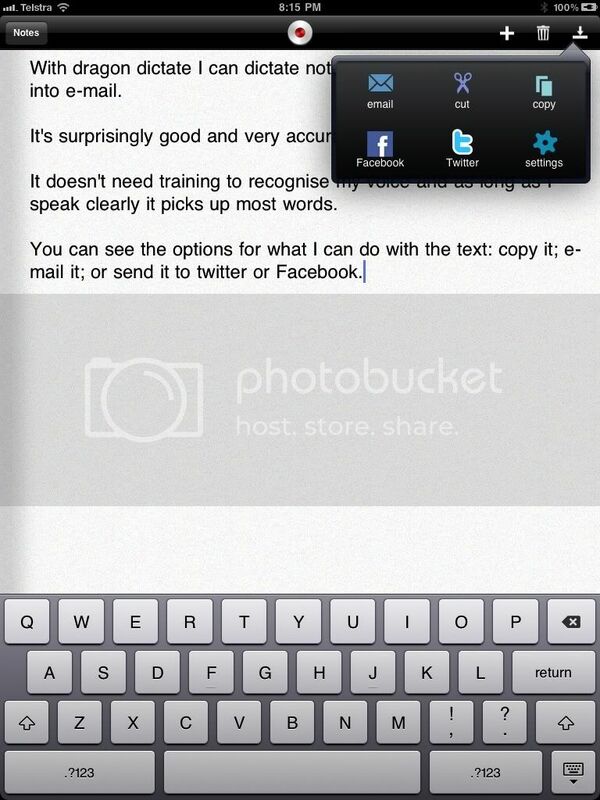 iAnnotate PDF (get it from iTunes here) can only work with PDFs. 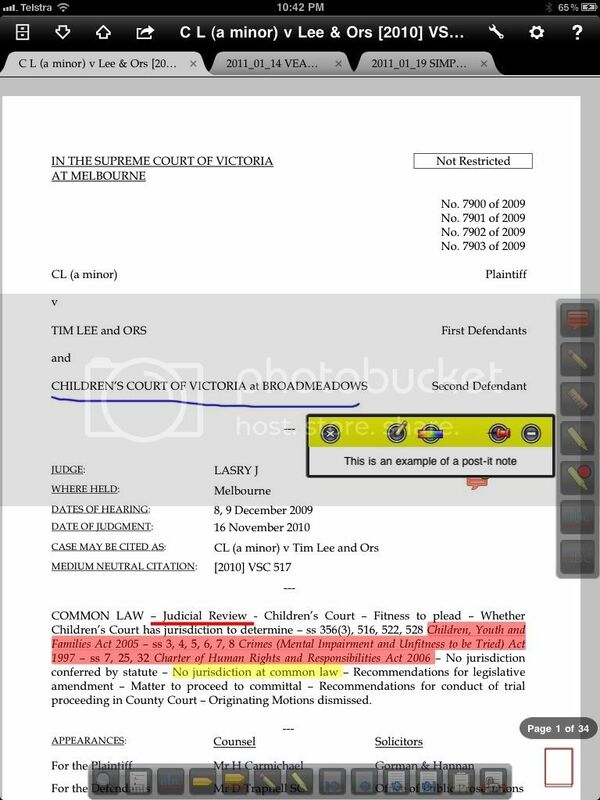 Tap the screen once to turn off editing and just view the document. 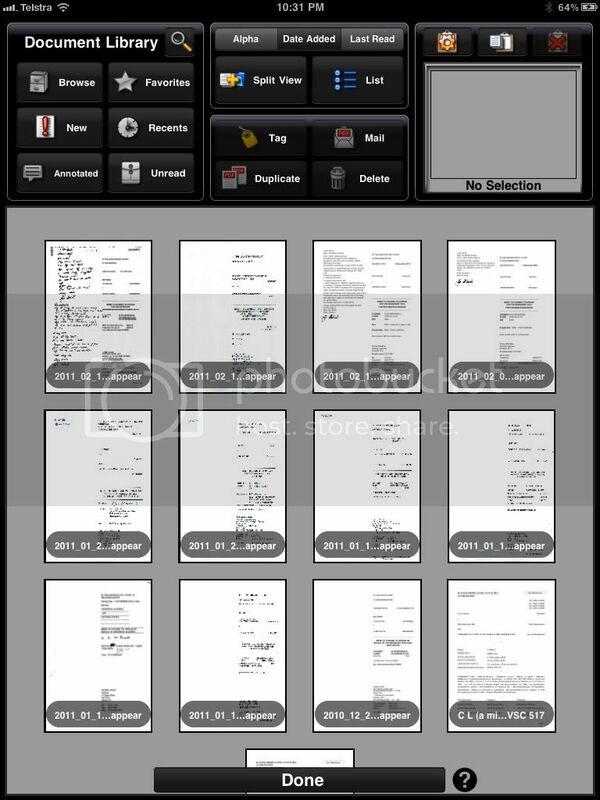 The document manager organises documents, and can create folders and tags with full drag-and-drop function! There are a couple of reasons I don't use iAnnotate PDF as my primary app. Visually, it's very busy, and I find the interface obscures some of my documents. It treats document bookmarks as outlines. I can customise the toolbars to view my bookmarks, but I don't know why the app deals with them in this non-standard way. It doesn't read other file types. It only allows me to access one DropBox. It scrolls pages by flicking top to bottom. To turn precisely a single page, you must use the turn arrows in the toolbars. 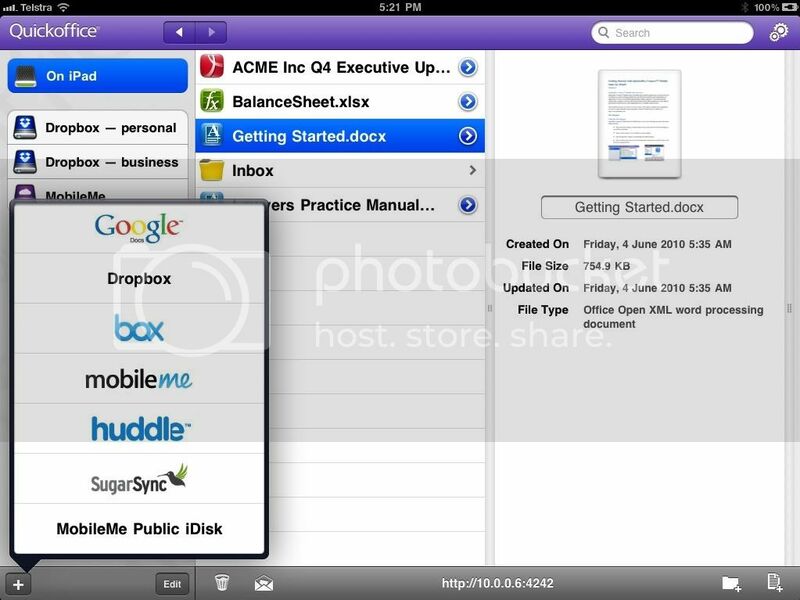 Readdledocs (get it from iTunes here) views a wide range of files and stores them on the iPad. It can download documents and attachments from websites, emails, computers, and cloud services. 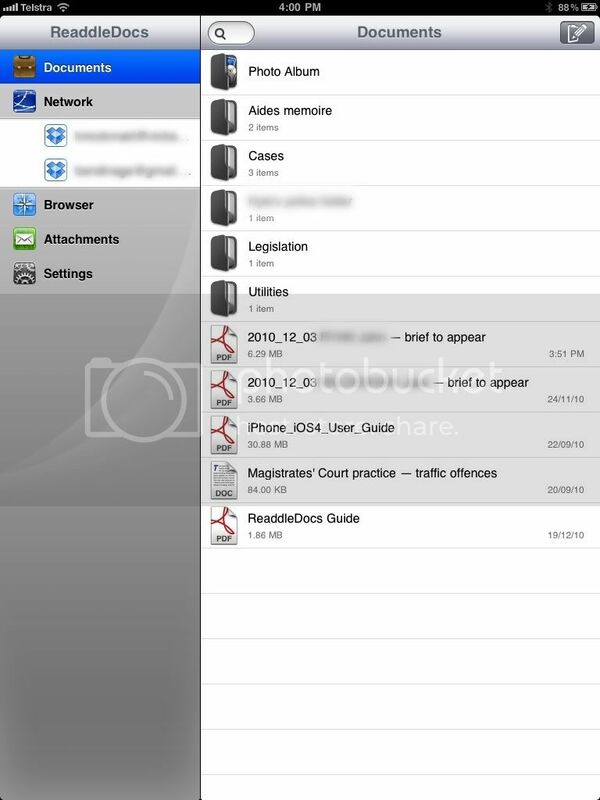 It too allows for folders to organise files. Readdledocs links to quite a few cloud providers — including multiple DropBoxes— and also offers email access — but only to IMAP and POP services (no Exchange servers). Annotating is limited to highlighting and adding notes. 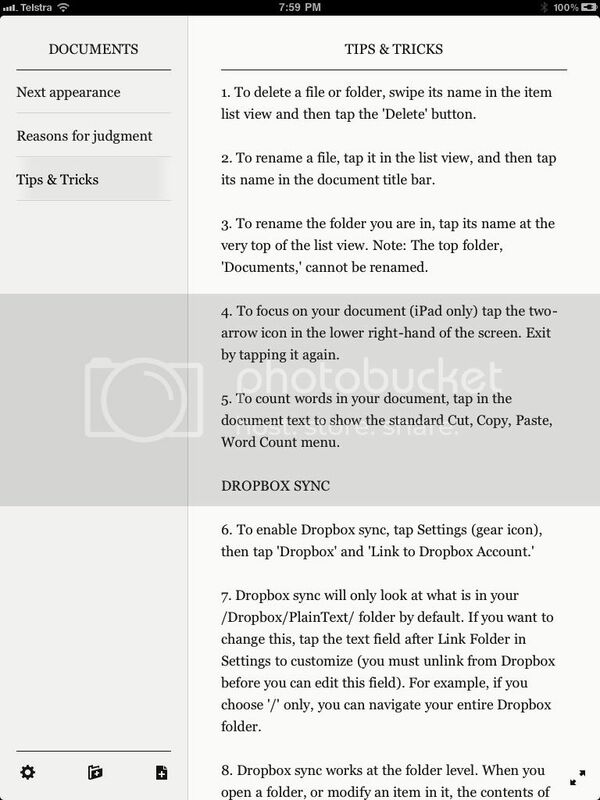 DropBox (get it from iTunes here) provides a free iPad app that links to a single DropBox. It can view many file types, but has no annotating ability and no capacity to save files on the iPad. You can email a link to an individual file, or open a file using another app like one of the ones above. SugarSync (get if from iTunes here) also provides cloud storage and synchronises files. I haven't used it much, but in my limited playing with it, I found the iPad app a bit clunky and slow. 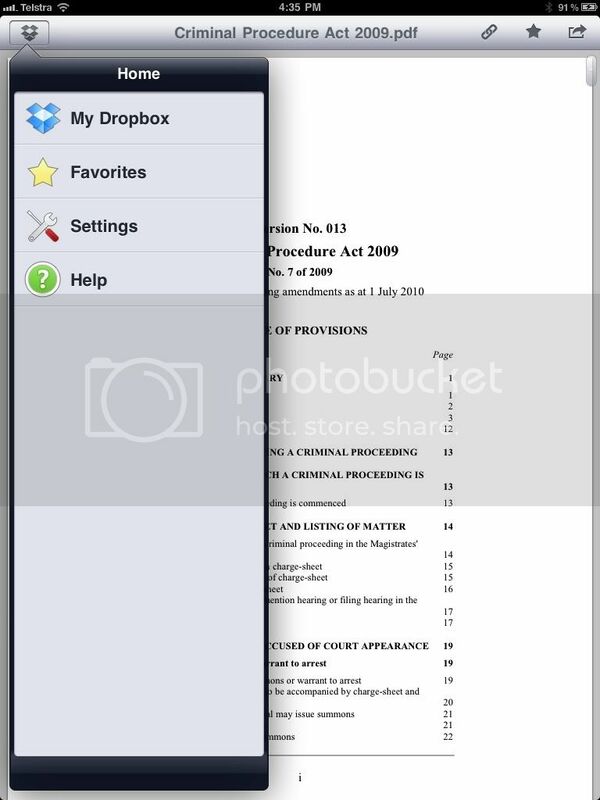 It doesn't offer annotating, but does allow files to be stored locally and opened in other apps. It allows access to any files or folders I select on my computer, not just those stored in DropBox. I don't use the iPad for this very much, but it’s possible to create spreadsheets and Word documents on the iPad. Most of the programs allow varying degrees of text manipulation, but struggle with anything more complex than text and two hard-returns. Footnotes and paragraph numbering are real problems, which means the iPad isn't helpful for formatting submissions. You might also like to look at Josh Barrett's Tablet Legal two articles on Word processors on iPad for lawyers Part I and Part II. Pages (get it from iTunes here) is Apple’s iPad version of its Mac word processor. I haven’t used it, so I can’t tell you anything about it, other than what I read. Quickoffice connect HD (get it from iTunes here) can create and edit MS Word and Excel documents, and read PDFs. It doesn’t provide for opening files in other apps. It provides access to cloud services, and you drop-and-drag files to the iPad icon to store them locally, and to the trashcan or email icon to delete or send. I find it doesn't import my document formatting when I used outline paragraph numbering and styles to provide paragraph spacing. It also undoes my formatting in my excel spreadsheets if I save the changes to DropBox. Office2 HD (get it from iTunes here) is another MS Word & Excel-compatible app. I haven't used it. Documents To Go Premium (get it from iTunes here) is another Word and Excel app, and also says it can create PowerPoint presentations, and also read PDFs. I haven't tried it, but I'm intrigued by the claim that the latest version can apply and view styles in word processing programs! I like also that it has a free trial. When I first started using the iPad I struggled to take notes when at court or talking with people, and then keep track of those notes and integrate them with my electronic documents. I think some of these apps provide a solution. 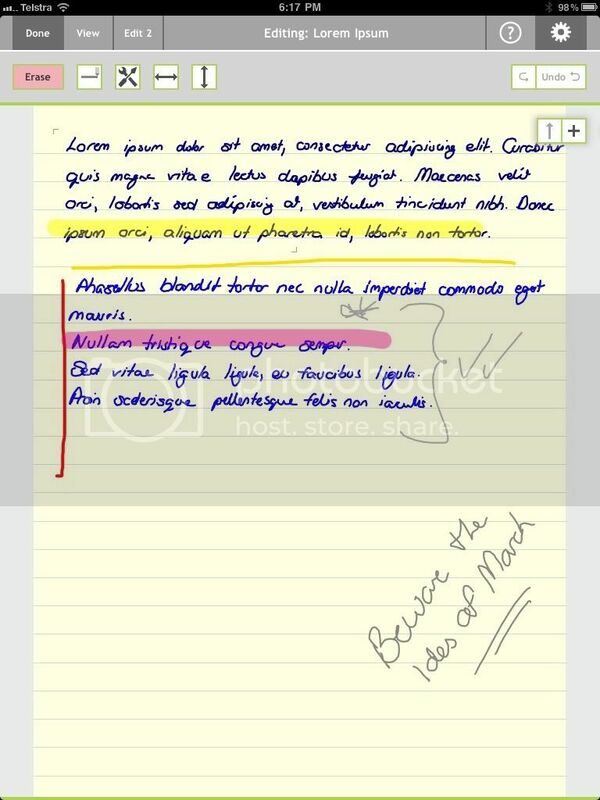 Note Taker HD (get it from iTunes here) lets me use the iPad like a note pad. All my notes are stored locally until I chose to delete them. You can see here the opening page, with notes listed on the left side; a preview on the right side; and the page tool menu open for the most recent note. Select individual notes by tapping on them from the list view on the left, then double-tapping the preview on the right. Here's the note open in Edit 1 mode (there are two editing modes), where the whole page is displayed. Pen colours and width are selected from the toolbar, and I can highlight text as well. Notes can be emailed as PDFs. I email mine to myself, and insert them into my brief before I file it in my completed folder. CP Notebook for iPad (iTunes link here) was only released a couple of weeks ago. CP Notebook is a great program on the Mac, and Notebook users have been hoping for an iPad version for a long time. Initial reviews are that the current version has a few hiccups, but great promise. I haven't tried the iPad version yet, but if it can sync with Notebook on my computer I'll be getting it. DropBox support is mooted soon, so that's probably when I'll spend $36.99 on it. Plain Text (iTunes link here) is a deliberately simple text editor. It links with DropBox, so getting notes onto computer is a cinch. 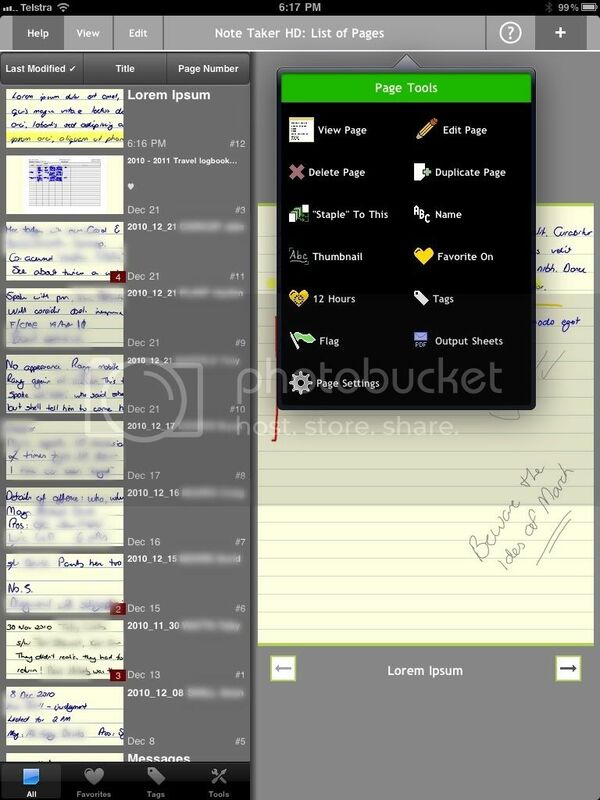 It simply contains a list of files on the left side, and text on the right side. There are no formatting options: just text. You can expand the text entry window to fill the whole page. I think for just typing text — like drafting a letter or advice — to format it later, this is ideal. The price is great too: free. Dragon Dictation (iTunes link here) turns the iPhone and iPad into a dictaphone. This eagerly awaited app was also only released in Australia a few weeks ago. It works surprisingly well, and also has a great price tag: free. Next: transferring information to and from the iPad. 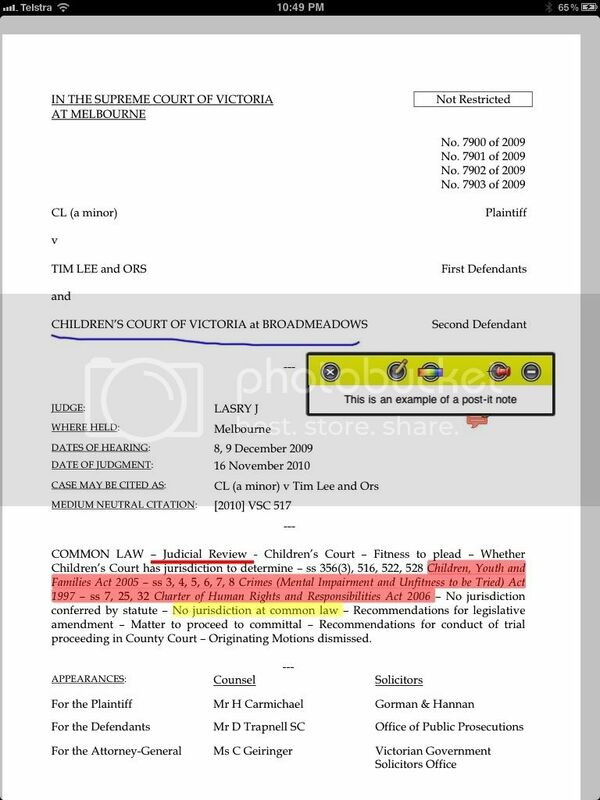 If you are a lawyer and are thinking if using dragon dictate you had better look at what the License agreement says before you agree. You need to look at what is says about what the company can do with your contacts and voice content. 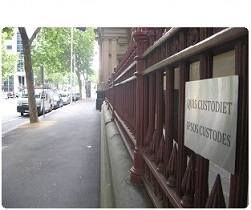 There are additional licence terms for Australians users. Have you updated to Note Taker HD 5.0?